Farabloc fabric shields high-frequency electromagnetic fields. Farabloc has been shown in research studies to shield the body from some types of electromagnetic fields. Electromagnetic fields are caused by the motion of an electric charge. The number of times that the electric current moves in one second is what defines the electric current’s frequency. If the current moves fast, this means that the frequency is high. If the current moves slowly, this means that the frequency is low. Fast moving electric currents can produce a high frequency electromagnetic field. Slow moving electric currents can produce what is known as a low frequency electromagnetic field. Human beings are surrounded by electromagnetic fields, such as those that are made by electrical devices. Examples would be TV sets, microwaves, radios, and the computer you are looking at right now. Such household devices generally produce low frequency electromagnetic fields. Examples of high frequency electromagnetic fields would be x-rays and rays from outer space (known as cosmic rays). Even the human body creates electromagnetic fields that are due to chemical reactions in the cells and the flow of ions (electrically charged particles) in the body. A cell is the smallest, most basic unit of life, that is capable of existing by itself. It is thought by some that electromagnetic fields can cause irritation to nerve endings. Normally, layers of body tissue protect nerve endings from electromagnetic fields that come from outside of the body. People with arms and limbs that have been cut off do not have this protection, however. Thus, some believe that when the unprotected nerve ending are exposed to electromagnetic fields, this causes irritation, which the brain perceives as pain and other types of discomfort. It is thought that Farabloc provides protection form the electromagnetic fields, reducing irritation. 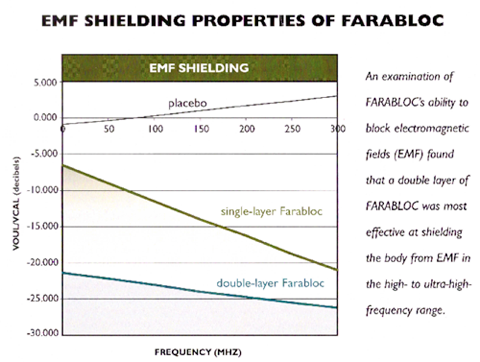 Farabloc works best at blocking high and ultra-high frequency electromagnetic fields. However, Farabloc may have a limited effect on very low, extremely low, and extremely high frequency electromagnetic fields. The good news is that as of yet there is no firm evidence of biological effects of low-level, low-frequency electromagnetic fields. 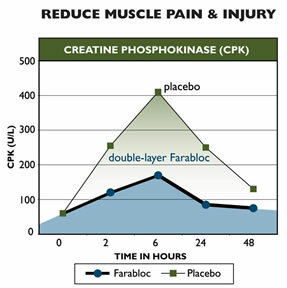 Farabloc may help to reduce muscle soreness by making the muscles cells more stable. After too much exercise, muscle cells become disrupted, which leads to inflammation, which then leads to soreness. Thus, decreasing the muscle cell disruption would help to decrease the soreness. In other words, Farabloc seems to work by blocking damage to the muscle. Some suggest that Farabloc may work through having an anti-oxidant effect. What does this mean? When a cell is destroyed, oxygen is usually released from the cell. The oxygen usually breaks down the cell next to it, which in turn, releases oxygen. This oxygen usually breaks down the cell besides it, and so on, like a wildfire. Farabloc may work by decreasing the effect of the oxygen (hence, the term “anti-oxidant effect”). By decreasing the effect of the oxygen, using Farabloc can be like throwing water on a fire before it spreads too much. Farabloc studies have demonstrated a profound positive impact upon blood chemistry, leading researchers to believe that the product is not just for pain relief, but likely an effective therapy for many difficult conditions, assisting the body in healing itself, particularly with respect to edema and deep vein thrombosis (DVT). Medical science has long established that heat increases blood circulation to the site of the injury. Increased circulation speeds up the removal of accumulated fluids that cause stiffness and swelling. This, in turn, speeds up the natural healing process ensuring a quicker return to fitness. As we know, blood transports oxygen and nutrients from our cells to wounds and weaknesses, assisting in its healing process. Interference with this transportation prolongs recovery. Research shows that healing is slowed, or perhaps even stopped, if there is repeated deprivation of blood supply from the area in question. Farabloc’s ability to reduce muscle pain and injury after exercise was demonstrated in a study published in the Clinical Journal of Sports Medicine, Philadelphia PA, which examined blood serum levels of five markers that indicate muscle damage, pain and inflammation. In the strength testing, it took the placebo group four days to recover to the strength levels the Farabloc group reached at just 24 hours after exercise, demonstrating Farabloc’s ability to speed recovery from muscle injuries and athletic training. The Farabloc Thigh Wrap was used in this study.